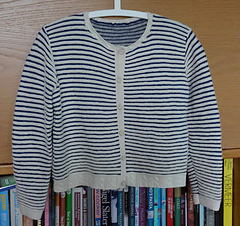 The Striped Cardigan features alternating bands of stocking stitch and reverse stocking stitch, creating contrasts of both colour and texture with the stripes. 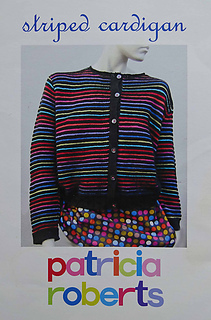 The cardigan is cropped, with long set-in sleeves and front button band. 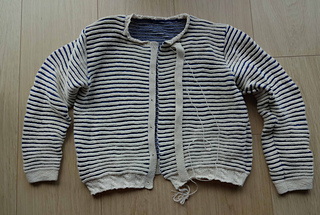 The cardigan band and neckline feature a cable pattern. Different yarn options are offered with this design: Cashmere, Lambswool and Fine Cotton. 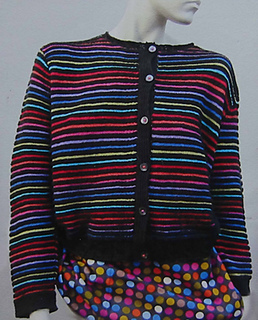 Quantities required for the main colour of the cardigan are 6/7 balls of Lambswool No 1 or 7/8 balls of Fine Cotton, and assorted contrast colours in the same yarn or the Angora.